Organize, store, transport, and protect your lenses from dirt, dust, and bumps with this 3-pack of 4" Padded Lens Cups from Porta Brace. For easy identification, the cups have clear vinyl windows, and are color-coded with blue, gold, and silver nylon tabs. Cups are semi-rigid, padded with soft poly-fill, and may be used to hold lenses or other fragile gear. The cups have zipper closures for security, and belt loops for attaching to a belt or strap. Made of nylon, the cups are strong and durable. Box Dimensions (LxWxH) 4.0 x 3.5 x 1.5"
4" Padded Lens Cups (3-Pack with Blue, Gold and Silver Tabs) is rated 4.3 out of 5 by 4. 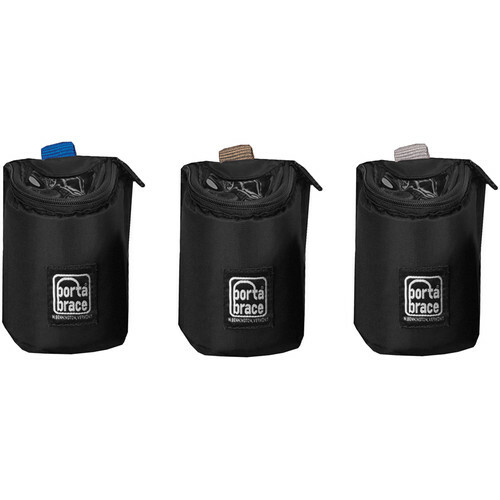 Rated 5 out of 5 by Alan from Protect your lenses and still get quick access These zippered pouches let you take your lenses everywhere and not just in a camera bag or camera backpack. Want to put your lenses on a belt? Done. Want to through them in any kind of case or backpack and not be a target for thieves? Done. Want to see what is inside without opening them up? Done ( clear tops or put gaff tape with lens description on the top). These are a great alternative to carrying a camera specific bag. Rated 5 out of 5 by Uashef from Porta Brace Lens Cups Are Awesome These Lens Cups are just perfect. No more big/balky camera bags. Just put these in messenger bag or backpack and good to go. Rated 5 out of 5 by Keegs from Love these bags I use them for everything! Lenses, caps, and even wireless miss. Don't go without them. Rated 2 out of 5 by Anthony from Not worth the price The quality is not worth the price. hi, do you have any that are bigger than 4 ? to accommodate bigger lenses? Porta Brace makes padded 7 lens cups as well, B&amp;H # POPB7LCSET. will these hold a canon 24-70 2.8 lens? No they won't. You'll need the 7'' version for that.